The X-Adapter REV5 was designed to withstand harsh environments 24/7 alongside HP Common Slot server PSUs. 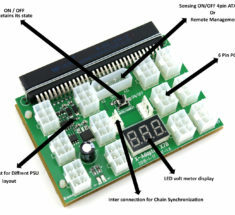 Features an on/off switch and 8 6pin PCIe ports. Connect to a server power supply and use this breakout board adapter to power Bitcoin Miners and GPUs. 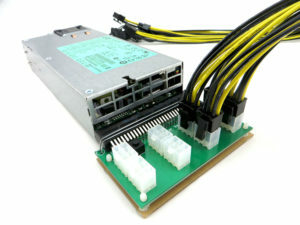 Compatible with most Gold rated Common Slot server power supplies (see full list below). Why the power supply X adapter? Power supplies capable of 1200 watts output can sell for hundreds of dollars. While all are third-party names and often low quality made in China, server accessory excess allows the market to acquire original TOP QUALITY power supplies at a fraction of the cost. The problem with server power supplies is their proprietary connectors. 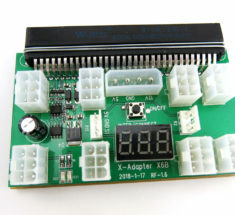 The X adapter solves this problem, allowing the power supply to be used for other applications such as Bitcoin miners, RC hobby, drones, and LED light displays. Note: Not compatible with Platinum rated server PSUs unless otherwise noted below. Note: Not compatible with the HSTNS-PD18 version of DPS-750RB-A. Pictures with cables or other items are for reference only. Is this compatible with HP PSU 1000W PN 379124-001? Hi, Joseph. I got a couple of the breakout boards from you and everything seemed fine when I first fired my rig up, but I used the button on the board to turn it off and now it doesn’t look like my PSU is providing any power when I turned it back on. Unplug everything just to eliminate possibility. Just PSU and X5 then try to power the PSU on. If that work fine you may have a short within your setup that prevent the PSU from starting up. In that case I would proceed one GPU at a time until you found the culprit. I sent you a message through the Contact form, but didn’t receive a response yet. If possible can I pay the difference and upgrade to the boards that you mentioned were definitely compatible with my PSUs (X7, X8, X11)? If needed I can ship the defective/incompatible boards back. Is your PSU dead? I had two of these X5 boards for HSTNS-PD11 PSUs and they wouldn’t power them on and caused a capacitor to blow up like a firecracker. Tried the other PSU with a known working X7 board and it powered on fine. They told me ver 5 and later boards were compatible before I ordered. Can this be set so that it auto powers on after power outage? Bought one of these with corresponding cables. Ordered at 1pm, and it arrived the next morning. Not even overnight shipping. +1 to Parallelminer.com and +1 to USPS. Fired right up. Running 24/7. Running 650W with no issues. Nice. I’m trying to work amplify my mining rig. It currently has an HP 1200W DPS-1200FB A bought from you guys. It comes with 6-pin slots. I use them in pairs – one slot for the GPU and the other for the riser. Therefore, I only have 3 GPU working out of it. I’m planning to add 3 GPU more yet lack the 6-pin connectors to attach them to the power supply unit. 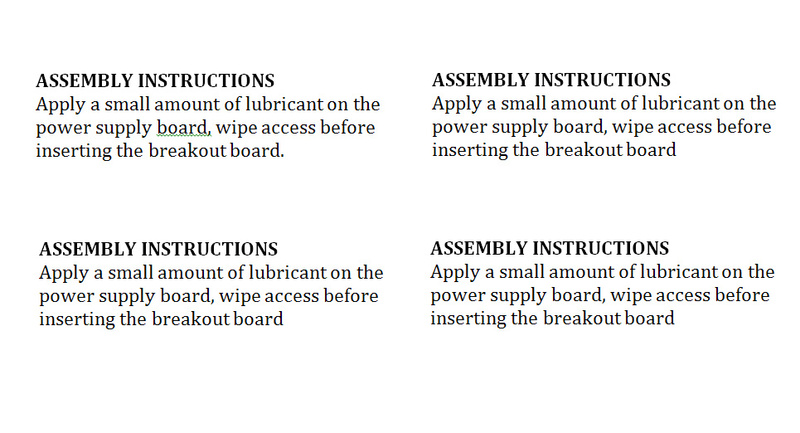 Would this X5 breakout board suffice? It has 8 6-pin connectors. One is needed to couple both breakouts with 6-pin male-to-male cable and other 6 to connect the incoming GPU. I’d need this breakout and 7 6-pin cables. Could you please confirm with me whether this setup will work or not and link me to the 6-pin cables link? Thanks! 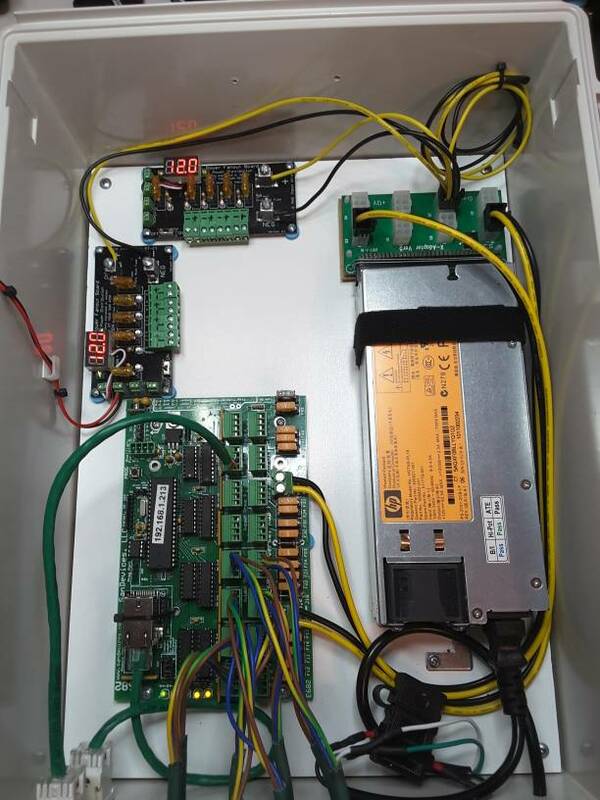 The REV 5 board will only work with the GOLD version of the 1200watt. If the back AC plug on the PSU is blue color that is platinum and the REV 5 will not work. In that case you would need the REv6 or 7 or 8 or 11. Have you tested this on DPS-750RB-A which is mentioned as a supported model ? I have bought 30 of them and they do not work on DPS-750RB-A. 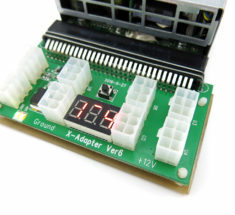 However when I test X7 BREAKOUT BOARD on the same DPS-750RB-A it works without problem. I can take a movie and show you. Yes, we have. Model DPS-750RB-A has two variations: HSTNS-PL18 with part numbers 506821-001, 506822-201, 511778-001, 512327-B21; and HSTNS-PD18 with part numbers 506822-101, 506821-001, 511778-001, 512327-B21. 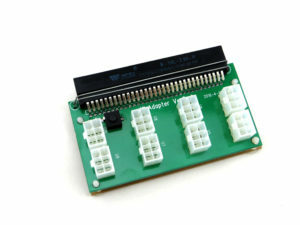 The X5 breakout board is only compatible with the HSTNS-PL18 variation as listed. The X5 adapter will not work with platinum PSU. They are also some version of 750 that will not be compatible. All X6B, X7, X7B, X8, X11 will be fully compatible. Your welcome to request an RMA for a refund or credit. 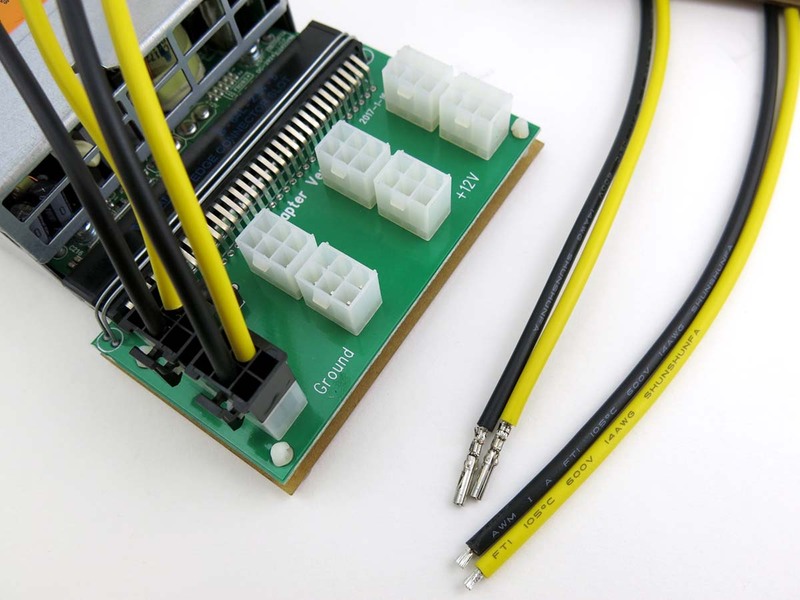 Built-in (8) PCI-E connectors on board for quick easy connect. 100Amps rated. 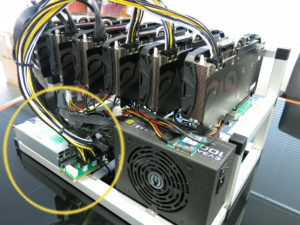 It can power Bitcoin Miners as well as GPUs.